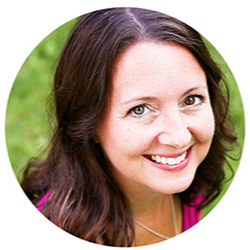 Yesterday at this time I thought I would be writing this post from the hospital. My 6-year-old was supposed to have surgery on his ear yesterday, but there was a different plan for him. After telling him NO EATING, he promptly went downstairs and chewed the chocolate off of a chocolate-covered almond. I called the surgery department and confessed the crime. If you aren't afraid of a little heat, this dish is for you. Saute a variety of healthy vegetables in a delicious thai basil sauce to make your own favorite takeout dish. You won’t regret learning to make this bowl full of spicy thai goodness! My hubby has been rockin' the kitchen lately. He has a really creative side to him, and I love when he expresses it with food. This is a recipe he has been perfecting for a while, and he made me promise not to write a post about it until he got it juuuust right. We were both extremely happy about how it turned out the other night, so I have been granted permission to share! By the way, it is another beautiful day here in Minnesota. I am loving this weather! I can't wait to get myself out of the house today. It's haircut day (I love haircut day! ), so I get to venture out sans boys for a bit. Weeee! Fully immerse the basil in the water and let the leaves soak for 10 minutes. - Cut 4 defrosted chicken breast halves into 1-inch cubes. - Thinly slice 3 shallots. - Mince 8 large cloves of garlic (add to the bowl with shallots). - Thinly slice 10-20 Thai chili peppers. Drain the water from the bowl with the basil leaves. Tailor the amount of peppers used to your liking. A good substitution for 10 Thai chili peppers would be 5 serrano peppers. Heat 3 tablespoons of peanut oil in a wok or large skillet over high heat. Add the garlic and shallots and cook for 30 seconds, stirring constantly. Add the chicken and cook, stirring constantly, for 2 minutes, or until the outsides of the chicken pieces turn white. Cook, stirring constantly, for 1 minute. Add the basil leaves and cook until they become shriveled, about 2 minutes. Remove the pan from the heat and stir in 3/4 cup chopped unsalted peanuts. Serve warm, over noodles or rice. This is one of my favorite spice meals of ALL TIME. If you love a little heat, you will not be disappointed. 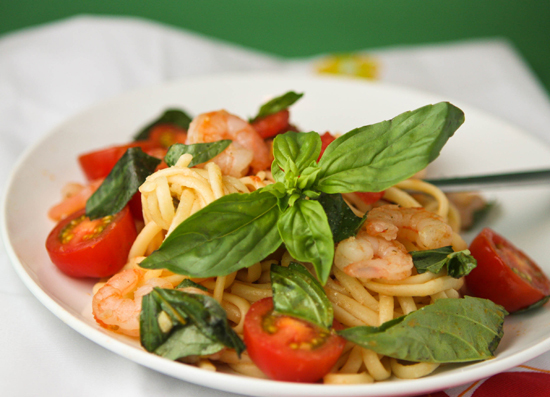 In a medium bowl, combine basil leaves and water. Fully immerse basil in the water and let soak for 10 minutes. Heat peanut oil in a wok or large skillet over high heat. Add garlic and shallots and cook for 30 seconds, stirring constantly. Add chicken and cook, stirring, for 2 minutes until the outsides of the chicken pieces turn white. Add Thai chile peppers (or Serrano peppers), soy sauce and fish sauce. Cook, stirring constantly, for 1 minute. Strain water from the basil leaves and add to the wok. 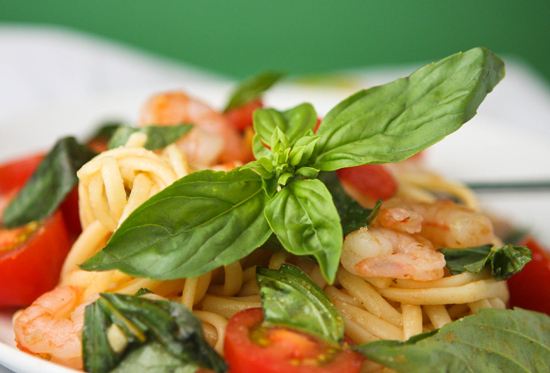 Cook until the basil is shriveled, about 2 minutes. Remove from heat and stir in peanuts. Serve warm, over noodles or rice. This is Week #34 of my 2011 cooking challenge! Click here to view all recipes from this challenge. All recipes created for this challenge come from the Food and Wine Annual Cookbook 2010: An Entire Year of Recipes. The end of August, and the end of SUMMER, my dear beloved summer, is approaching, which means I am attempting to squeeze in as many summer-time recipes as I can. I love summer recipes. Salads, fresh fruits and vegetables, anything on the grill, ice cream, cold cold margaritas, I could go on and on.. 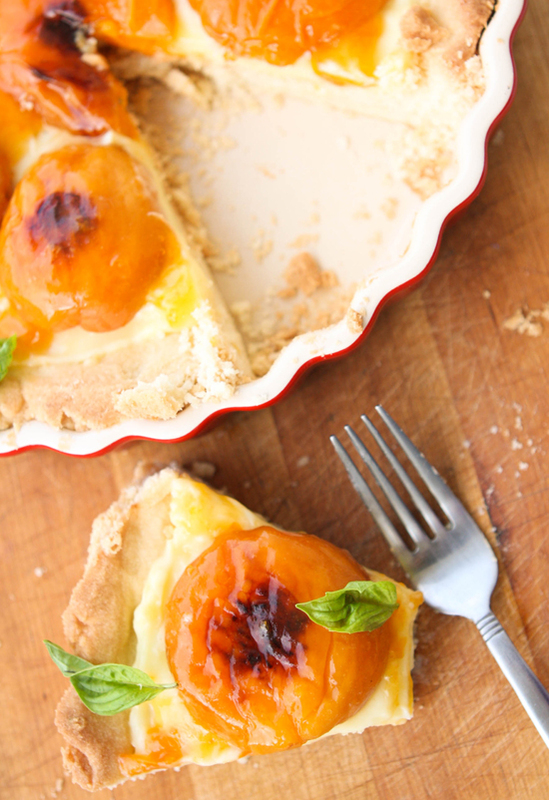 I was excited to make this apricot tart because I thought it would be a fresh, light end-of-the-summer (sniff) treat. It was totally scrumptious. I have to mention that the shortbread crust on this thing? OMG! Better than the best Christmas cookie I've ever tasted. LOVED IT TO PIECES. First, make the pastry cream. Bring to a simmer. Remove from the heat and let stand for 15 minutes. Remove the basil from the pan. Slowly whisk the yolk mixture into the warm milk in the saucepan. Bring to a simmer over moderate heat, whisking constantly until very thick, 2 minutes. Remove from the heat and whisk in 2 tablespoons unsalted butter until melted. Scrape into a bowl and press plastic wrap directly onto the surface. Refrigerate until chilled, 2 hours. Looks like lemon curd, doesn't it? Well it is a little bit shocking when it tastes nothing like lemon curd! Now make the pastry (the yum yum delicious pastry that I'm madly in love with). Spray a 14x4-1/2-inch rectangular tart pan with a removable bottom with nonstick cooking spray. Or do like I did and use a 9-inch round tart pan without a removable bottom. Beat with a hand mixer at medium speed until smooth, 2 minutes. Beat at low speed until just combined. Using lightly floured hands, press the dough evenly over the bottom and up the sides of the tart pan. Refrigerate the crust for about 30 minutes, or until chilled. Bake the crust for about 25 minutes, until golden. Cool for 1 hour. Line a baking sheet with parchment paper. Arrange 6 apricots, halved, cut side up, on the paper and sprinkle all over with 3 tablespoons of granulated sugar. Roast in the oven for about 20 minutes, or until the apricots are tender and lightly browned. Cool completely, about 30 minutes. Unmold the crust onto a serving plate and spread the cream evenly in the crust. 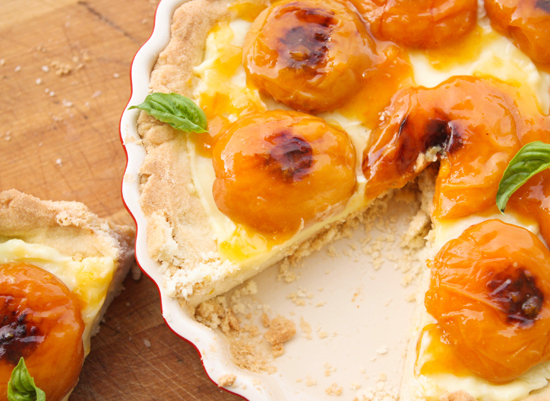 Arrange the apricots on the cream, cut side down, and brush all over with 1/3 cup melted apricot jam. Cut tart crosswise into strips and serve. You might notice that I left the tart in the tart pan and cut it like a pie. It worked just fine this way! Decorate with basil leaves, if desired. 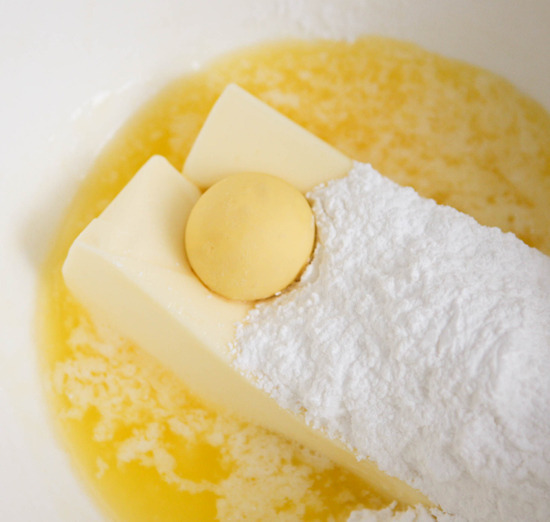 MAKE THE PASTRY CREAM: In a saucepan, combine ¾ cup of the milk with the sugar and basil; bring to a simmer. Remove from the heat and let stand for 15 minutes. Remove the basil; squeeze any milk back into the pan. 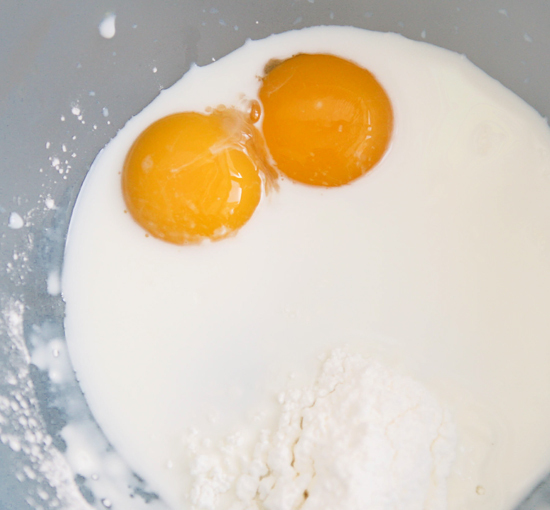 In a bowl, whisk the remaining ¼ cup of milk with the yolks and cornstarch. Slowly whisk the yolk mixture into the warm milk; bring to a simmer over moderate heat, whisking constantly until very thick, 2 minutes. Remove from the heat and whisk in the butter until melted. Scrape into a bowl. Press plastic wrap directly on the surface and refrigerate until chilled, 2 hours. MAKE THE PASTRY: Preheat the oven to 375 degrees F. Spray a 14x4 1/2 –inch rectangular tart pan with a removable bottom with nonstick cooking spray. 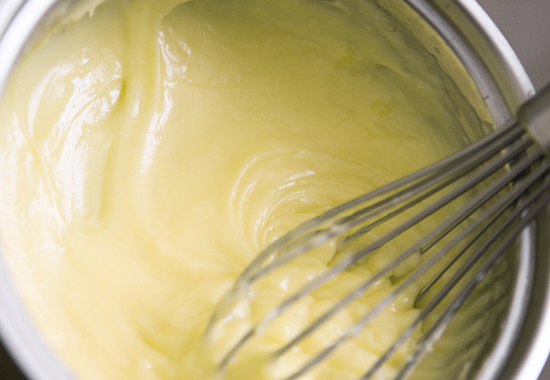 In a standing mixer, beat the hard-boiled egg yolk with the butter and confectioners’ sugar at medium speed until smooth, 2 minutes. Add the flour, potato starch and salt and beat at low speed until just combined. Using lightly floured hands, press the dough evenly over the bottom and up the sides of the tart pan. Refrigerate the crust for about 30 minutes, or until chilled. Bake the crust for about 25 minutes, until golden. Cool on a rack for 1 hour. MAKE THE TOPPING: Increase the oven temperature to 450 degrees F. Line a baking sheet with parchment paper. Arrange the apricot halves cut side up on the paper and sprinkle all over with the sugar. Roast for about 20 minutes, until tender and lightly browned. Cool completely, about 30 minutes. Unmold the crust onto a serving plate and spread the cream evenly in the crust. Arrange the apricots on the cream, cut side down, and brush with the melted jam. Cut the tart crosswise into strips and serve. This is Week #30 of my 2011 cooking challenge! Click here to view all recipes from this challenge. All recipes created for this challenge come from the Food and Wine Annual Cookbook 2010: An Entire Year of Recipes. Bing cherries are the first things I see upon entering the grocery store. I almost always put a bag in my cart. Usually I end up snacking on them throughout the week and ultimately eating the entire bag by myself. My four-year-old tells me, "Mommy, you're going to turn into a cherry! And Sammy is going to turn into a blueberry!" It's true, I can see both things happening. Sam adores his blueberries and I adore my cherries. I rarely think to cook with cherries because then I would need to buy two bags every week! One to snack on and one to cook with. This week, though, I desperately wanted to try this cherry gazpacho. And I'm glad I did. 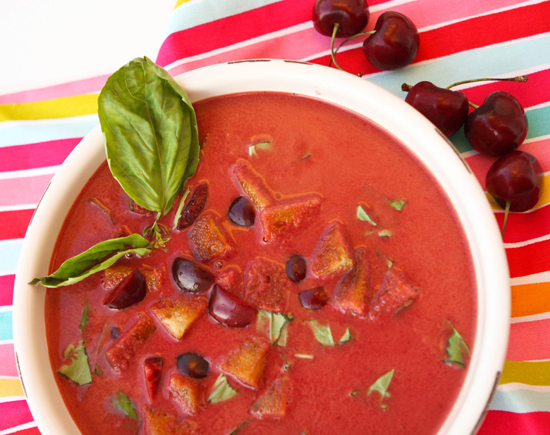 Upon taking my first bite of this summery soup, the following words popped into my head: FRESH, cherries, cucumbers, FRESH, summer, basil, YUM. Ladle the cherry gazpacho into shallow bowls. Garnish with the diced cherries, croutons and torn basil leaves. 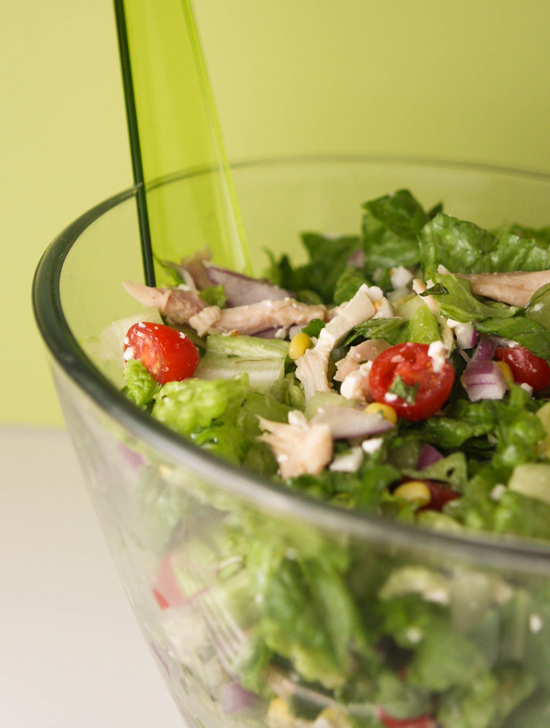 Drizzle with olive oil and serve the soup right away. My first attempt at adultifying the good old Grilled Cheese turned out fabulous, if I do say so. I could hardly stand to take the photos. I was dying to sink my teeth into its sandwich-y flesh! And once I did, it did not take long for me to shove the entire thing down my throat. Delicious, I'm telling you, delicious!